Operatives of Special Anti-robbery Squad (SARS) attached to the Police Commands in Kano and Katsina states have arrested two suspected armed robbers in full camouflage Army uniform in Katsina State. The Public Relations Officer of the Police Command in Kano State,DSP Magaji Majiya, disclosed this while presenting the suspects to newsmen in Kano on Thursday. He said the suspects were nabbed on Wednesday while trying to cross to Niger Republic with a new unregistered Ford Hilux vehicle which they allegedly robbed from port Harcourt, Rivers. 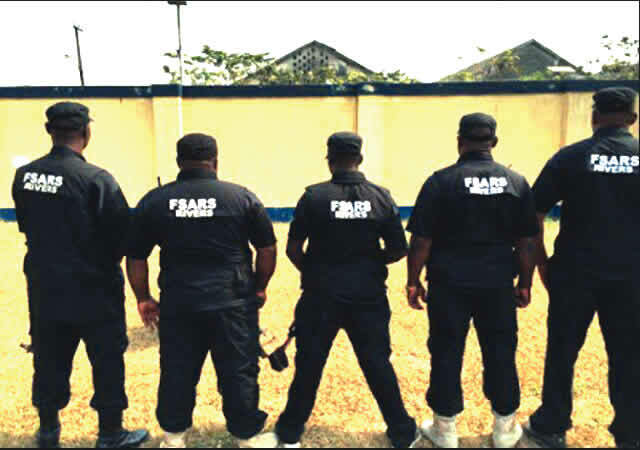 “The operatives of SARS attached to Kano and Katsina State Commands while acting on a tip-off ambushed and arrested Abubakar Ibrahim of Kurmin Mashi Quarters, Kaduna State, and Jaduwa Thalma of Askira Uba Local Government Area of Borno. “The suspects were in full camouflage army uniform and were about to cross to Niger Republic when the they were picked,” Majiya said. He said during interrogation, the suspects confessed to being dismissed soldiers who deserted from the service when posted to Baga on Operation Lafiya Dole. He said one of them a.k.a ‘Abu Soja’ was a notorious armed robber who was declared wanted by the IGP Special Tactical Squad (STS), SARS Rivers Command, and had a pending case at SCIID in Bompai, Kano. Majiya said the suspects would be charged to court as soon as the ongoing investigation was completed. He said the Commissioner of Police in the state, Mr Rabi’u Yusuf, had commended the IGP Special Tactical Squad (STS), SARS operatives attached to Kano, Katsina and Rivers states for working together toward the successful operation. (NAN).